Origin: This territory was first granted in 1753 as Heidelberg (spelled Hiddleburg in the grant document). The name was probably in honor of George II's visit to his German possessions at the time, and may also have been influenced by Governor Benning Wentworth's European travels. The town was granted again in 1773 as an addition to the Alexandria grant, and named Alexandria Addition, but the name didn't last. It was incorporated as New Londonderry, later shortened to New London, in 1779. 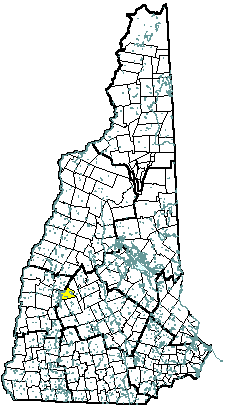 New London is the location of Colby-Sawyer College. Population Trends: Population change for New London totaled 2,668 over 52 years, from 1,738 in 1960 to 4,406 in 2012. The largest decennial percent change was 31 percent between 1970 and 1980; population increased by 29 percent between both 1960 to 1970 and 1990 to 2000. The 2012 Census estimate for New London was 4,406 residents, which ranked 82nd among New Hampshire's incorporated cities and towns. Population Density and Land Area, 2010 (US Census Bureau): 195.5 persons per square mile of land area. New London contains 22.5 square miles of land area and 3.1 square miles of inland water area.